Hello my name’s Matt and this is Pixel Burn, where I look at some of the more important, interesting or irritating things that happened in gaming over the week. Not much, as it happens. In fact it’s been a pretty bloody slow month for actual news, all things considered. I suppose that’s what I get for not just regurgitating press releases. First of all, literally seconds after I began uploading last week’s episode of Pixel Burn, word came from Alamogordo, New Mexico that E.T. cartridges have indeed been discovered at the old landfill south of the city. As you’ll know if you watched last week’s episode, Atari reportedly buried millions of copies of it’s E.T. – The Extra Terrestrial game for the Atari 2600 in a desert landfill back in 1983. Last week here in space year 2014 a film crew from Microsoft Xbox Entertainment were excavating the site for an upcoming documentary, to see if there was any truth to the story. And it turns out there was! As well as original E.T. cartridges for the Atari 2600, some still in their original shrinkwrapped packaging, the film crew also found cartridges for decent games like Space Invaders, Defender and Centipede buried amongst the trash. So there we have it! An urban legend is confirmed as true and a piece of gaming history literally dug-up from the ground, like proper archaeology. Although I do still prefer my own terrifying little prediction for the dig. Speaking of ancient cosmic evils laying waste to the Earth, rumours that a remastered Mass Effect Trilogy is coming to Xbox One and PS4 got a boost this week when Chilean videogame retailer Zmart Games accidentally showed both versions on its site. Needless to say the evidence has since been removed, but this is the internet so of course people took screenshots before that happened. But, if The Last of Us can get a remastered version – and before the PS3 version even got within spitting distance of the bargain bin, there’s no reason the Mass Effect Trilogy can’t be re-released for a new generation. It’s certainly something that’s been discussed internally at BioWare, as BioWare GM Aaryn Flynn confirmed in this twitter exchange with a Mass Effect fan. Discussion is not the same as doing of course, athough at least BioWare haven’t entirely ruled it out. Unlike those big fat fibbing fibbers at Naughty Dog who outright said they weren’t planning a PS4 version of The Last of Us…while they were busy making a PS4 version of The Last of Us. For the record I genuinely like the idea of a remastered Mass Effect Trilogy. Barring the last five or ten minutes of Mass Effect 3 it’s a fantastic series of games that have more than earned their places as classics of the previous generation. Though I wouldn’t mind seeing some sort of upgrade deal for any possible PC versions, ala Deus Ex: Human Revolution’s Director’s Cut. Hint hint, BioWare. And while we’re on the subject of rumours and scuttlebutt, screenshots have circulated via Neogaf of what is reportedly the next game from Dark Souls and Demon Souls creators From Software. Bearing the working title “Project Beast”, the following horribly compressed screenshots should look comfortably familiar to fans of From Software’s previous dark fantasy adventures. Particularly this shot of a character walking through a doorway full of fog, a recurring event in the Souls series and one that often results in death. Lending some credence to this are some not-so-cryptic posts from known industry insiders on NeoGaf, including this chappy who is confirmed to work for Sony and has been dropping hints as far back as last year. And earlier in April of this year, Japanese gaming magazine Famitsu investigated rumours that From Software and Sony were working on a PS4 exclusive sequel to Demons’ Souls, for which Sony owns the IP rights. When asked about this Sony would only say “We have nothing to announce at this time.” Which is so blatantly saying “”We’re Totally Making A Sequel To Demons’ Souls” without actually saying “We’re Totally Making A Sequel To Demons’ Souls” that they could only be more blatantly saying “We’re Totally Making A Sequel To Demons’ Souls” if they wrote “We’re Totally Making A Sequel To Demons’ Souls” in the sky above Tokyo. In response to this Famitsu…completely dismissed the rumours, because no games company ever keeps things from the gaming press. It’s also worth mentioning that the reason Hidetaka Miyazaki, the producer for Dark Souls, was not the producer for Dark Souls 2 is that he’s been working working full time on another unannounced project since 2012. Assuming these screenshots are genuine, and not a very elaborate hoax by someone with waaaaaaaaaay too much time on their hands, it’s reasonable to assume they are related to Miyazaki’s next project. Whether that is an actual Demons’ Souls 2, another spiritual successor in the vein of Dark Souls or something entirely different, however, remains to be seen. All we can do right now is speculate until the cows come home, die, get resurrected at a bonfire and then die again. I mean, look at the main character’s hat in this screenshot for example. For all we know this could be a next-gen sequel to Chakan: The Forever Man on the Sega Megadrive. Speaking of doing things for power: thanks to those cheeky scamps at Destructoid, who acquired the trailer for it from a trusted source, the next Call of Duty game was revealed to the world two days before it was officially supposed to. And as you see, I can barely contain my excitement. Wooooooooooo. This newest instalment goes by the imaginative title of Call of Duty: Advanced Warfare and is being developed by Sledgehammer Games, who previously worked with Raven Software and what’s left of Infinity Ward on Modern Warfare 3. Now like Treyarch before them they’ve been given their own slice of the CoD pie to work on, and they’ve been busy adding new ingredients like hoverbikes, power armour, cloaking devices, magic sci-fi climbing gloves and actor Kevin Spacey. In fact Kevin’s presence made watching this trailer a somewhat surreal experience for me. Because while my eyes were seeing one thing, my brain processed it as something completely different. Indeed, I couldn’t shake the idea this was the trailer for a weird, alternate-universe version of House of Cards where Frank Underwood quits politics, starts a Private Military Corporation and seizes control of America by force of arms. Then puts Gwyneth Paltrow’s head in a cardboard box. For pity’s sake the trailer even has the tagline “Power is Everything.” Gods, this couldn’t be more “House of Cards: The FPS” if it tried. Anyhow, if you’re looking forward to following Kevin Spacey around while he opens doors for you then Call of Duty: Advanced Warfare is due for release on November 7th of this year. 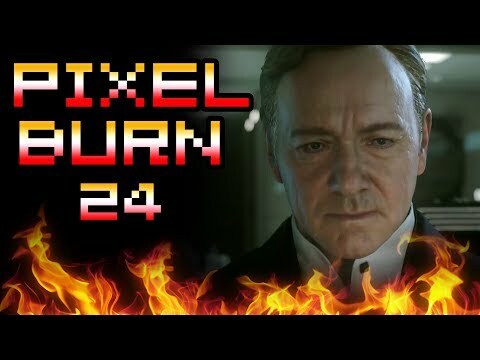 That’s all for this episode of Pixel Burn. If you liked it then please do let me know, and let your friends and pets know as well. At the very least I hope you found it tolerable. If you didn’t like it then, well, you may very well think that…I couldn’t possibly comment. Except to say you can go now.